So one would hope that I would have had more than 2 posts about Breath of the Wild in the past month… but for those that own the game, you see the dilemma. Posting up posts about the games takes time away from playing the game! I am quite a ways in, though I keep doing side quests rather than the main path cause I don’t the game to end. I have reclaimed 2 of the 4 Divine Beasts, and have discovered 11 out of the 13 memories. And still have so much missing! 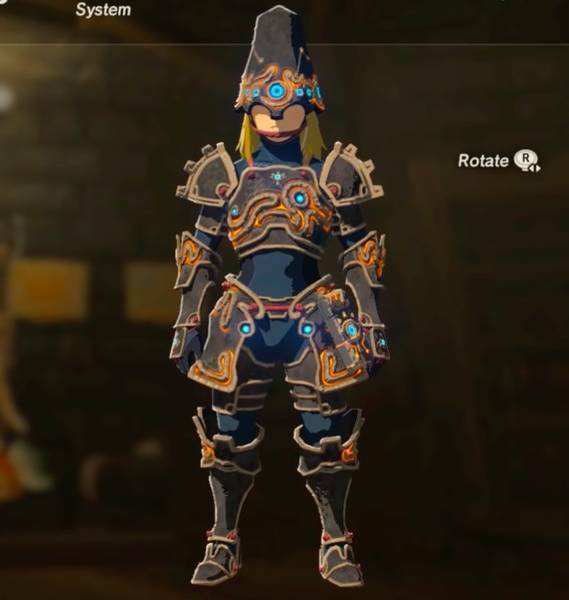 I think my favorite armor at this point is the Ancient Armor set. You can purchase this from the Akkala Ancient lab. Well, my favorite except for the atrocious helmet! Thankfully I have the Diamond Circlet which compliments the Ancient Armor nicely, though you don’t get the Set Bonus, Ancient Proficiency. If I didn’t have a job and did cosplay full time, this would be what I made from Breath of the Wild. It would take quite a bit of Worbla and Light Tape, but this would be one sweet (and sweaty) outfit to wear. And while I normally like to dye my armor, I think the dark body suit works well with the suit. I was hoping to dye the armor bits white and leave the body suit dark, but alas, you don’t always get what you want. I am continuing to work on my Champion’s Tunic cosplay. Unfortunately the first one that arrived was too small for me (so Sara modeled that for us, pictures soon). The second one has now arrived, so I will be wearing it soon. We should have this tunic available for purchase on the website shortly, and will have the smaller one available for sale at MTAC this weekend.